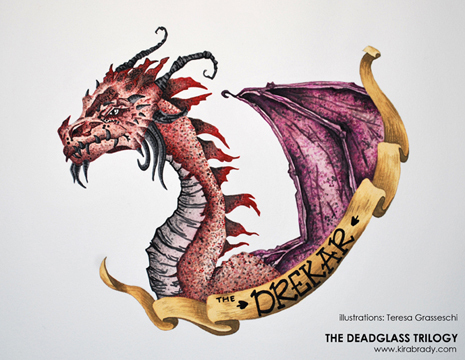 Teresa Grasseschi, the artist who is drawing me pictures and a map for the Deadglass Trilogy, finished the three crests! They look Fabulous. I am so excited to see how she is bringing Hearts of Darkness to life in visual art. Today I will share with you the crest for the Drekar, the immortal soul-sucking dragon shifters who live in the Norse neighborhood of Ballard and plot to unleash the Gates to the Land of the Dead. The illustration is of Sven Norgard, the Drekar Regent, in dragon form. Enjoy! 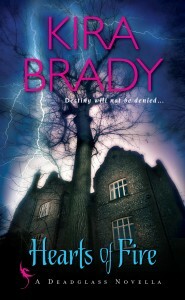 These images belong to Kira Brady, they may not be reproduced or used without permission. 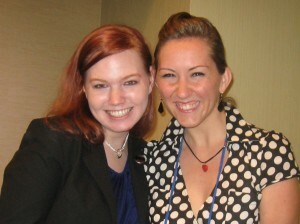 Next week I will be in Disneyland attending the Romance Writers of America national conference in Anaheim. Conveniently located near the Happiest Place on Earth, I’m not sure if anyone is going to actually be going to the conference. If you’re headed to RWA or live nearby, your first opportunity to get your hands on a fresh off the press autographed copy of Hearts of Darkness (official release Aug 7) is on Wednesday at the Anaheim Convention Center at 5 pm. I will be signing at table 702. There will be maps, but just in case you have trouble finding me, I’m the girl with the blue hair in the blue dress next to the blue books. If you’re headed to the conference, there will also be books at the Kensington publisher preview on Saturday afternoon. However, last year the Kensington signing ran out of books after 15 minutes, so get there early. Proceeds from book sales go to ProLiteracy Worldwide, Read Orange County, and Literacy Volunteers—Huntington Valley. No outside books are allowed in the event. This year it is NOT alphabetical. I will be at table 702. Please check your map and say hi! I’m over at the Qwillery talking about where I got the idea for the Deadglass Trilogy and sharing an exclusive excerpt. Please join me! I’m giving away 5 digital copies of the prequel novella, Hearts of Fire, to 5 random commenters. Also, Sally clued me in that Chapter 1 of Hearts of Darkness is up on the Kensington website. You can read it here. 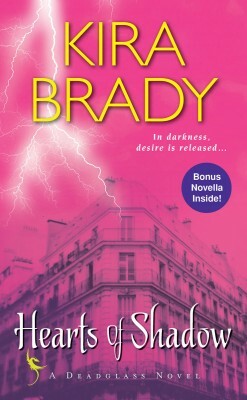 Yesterday was the release day of Hearts of Fire, my very first story. This Romeo & Juliet novella is a prequel to the Deadglass Trilogy (but you don’t have to read it first). Available for Amazon kindle and Barnes & Noble Nook for a buck. To celebrate, here’s an excerpt from the beginning of Hearts of Fire. It’s set a century and a quarter before the events of Hearts of Darkness (book 1). She didn’t want to like him. The stranger was too pretty, for one. Too arrogant, for another, and the last thing she needed was another arrogant man trying to manage her life. Alice watched the cocky set of his shoulders as he directed men to unload his wagon in the middle of town. Looked like a lot of useless bags of sand. Didn’t he know that no amount of sand could dry out these streets? He didn’t get his own hands dirty, just waved them around like some bossy Easterner. She would have moved on past and laughed as the mud splattered his boots, but the sun chose that moment to break through the ever-present clouds and illuminate his hair in golds and ambers and strawberry wheat. Lady be. What hair! Everything about him was golden, like the sun Changed to human man and come down to walk among them. He wore no hat. His hair curled free to the nape of his neck. He cast their surroundings in the dull, lifeless colors they truly were. Moss green. Brown. Gray sky and gray sea and gray distant mountains. Ye gods, he lit up her world like a thunderbolt. Hair like that should be outlawed. It could cause a person to lose all sense and fall off her horse. No wonder he’d fled here to Seattle. He’d probably caused pandemonium back east. There was nowhere farther west to go. Seattle had been awash with new arrivals hard on their luck: gunslingers, cowpokes, gambling men driven to make it on the new frontier. They were so much worn grist for the sawmills, shingle mills, and mud-soaked pile of logs they called a city. Alice didn’t mind it, because it was her town and her land and she knew the deep places beneath her feet were more than a match for these money-mad humans with their saws and hammers and constant noise. Her people had been here since time began. She could tell this stranger was no ordinary cowboy. He wasn’t the first Norseman to arrive. There were half a dozen men like him: tall, blond, and arrogant as sin. Their hardness set them apart from the other Scandinavian immigrants; they seemed chiseled from the glacier’s edge. As if Vikings had walked off the pages of her history book and onto the wet Seattle streets. “Look at the way he moves,” Alice said. His eyes were turned away—Alice couldn’t tell the color—and she was glad for it. Already her skin felt tight. Her stiff corset was the only thing that propped her up. Please, let his eyes be some muddy, forgettable shade! But she could see from his golden glowing skin and his golden glowing hair and his arrogant stance that her poor heart would be jerked again when she caught sight of those windows into his soul. “That’s the man I’m going to marry,” she said. “He’s not one of us,” Aunt Maddie snapped. Nathaniel growled in agreement. Alice turned and gave her a sympathetic smile. Her aunt’s black mourning gown shadowed what had once been a welcoming soul equal to her father’s. After a loss, some folk closed up and hid away their hurt, like Aunt Maddie. Some folk went the opposite direction—drinking and dancing until their feet bled as if they could fill that empty spot with noise and laughter and constant motion. Her father was one of those. Maybe that’s why he welcomed the new arrivals with open arms. After her mother died, he’d been more than ready to join the wider world and the stifling noise that came with it. The economic opportunities didn’t hurt either. “A wager we can’t hope to lose, Ali-girl,” her father had said. “Can’t fight the future. We gotta hit the ground running and play this game that we were meant to play. What hope does a human have against the intellect of the Raven?” And he’d ruffle her hair like she was eight again, not eighteen and a woman grown. Halian Corbette was all big plans and overflowing optimism. Alice knew life was precious and short. She wasn’t going to waste a gift from the Lady, even if it came wrapped in an unknown package. Especially if it came with a gorgeous, golden, glowing bow on top. “And so?” she asked Aunt Maddie. “He is my destiny.” As the words left her lips, she felt their truth ring deep in her bones. “What about Will?” Maddie asked. “What about him?” Alice focused all her attention on the Aether—that sparkling river that surrounded all matter and wove the fabric of the universe—and managed to send a small ripple of energy toward the golden stranger. It snapped and crackled through the damp summer air until it sparked against his cheek. His head jerked around, and he saw her. His eyes were the color of the winter sky at dawn. His cheekbones cut like arrows to frame those pale blue eyes. Ancient eyes. Eyes that had seen more of the world than she, miles and miles of suffering and blood. But the world-weariness dropped away as he focused on her. Inside her half boots, her toes curled. A little flutter like a moth took wing in her belly. It climbed until it flittered at the curl of her lips, seeking the warm glow of him. She let her smile convey hello. Brand tried not to stare at the ebony-haired woman in the sky-blue dress who was most improperly staring at him. He was used to looks from woman everywhere—what Drekar wasn’t? —but this one punched him in the gut. He felt suddenly sympathetic to women everywhere who became hysterical at the first sight of him or his kind. 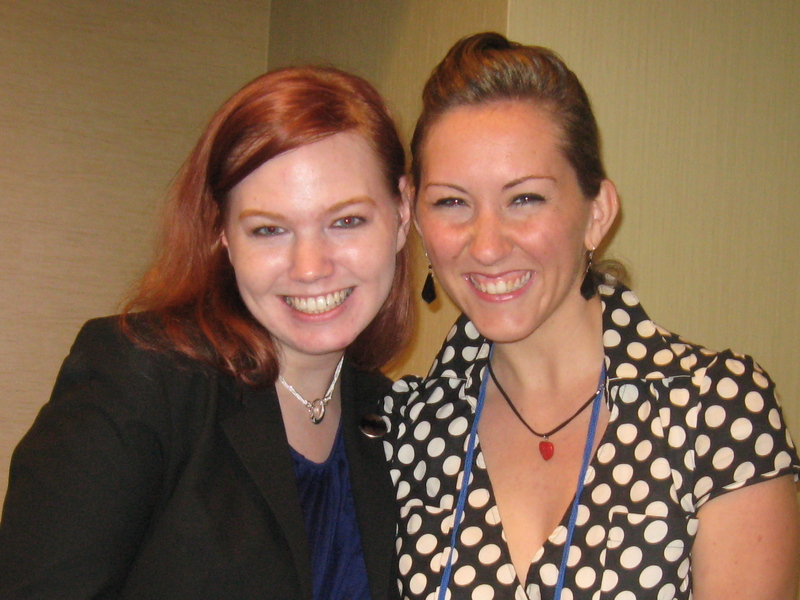 The Drekar were gorgeous. Stunning. Not an ugly one among them. But inside was something not human. Something dark and dangerous that liked pretty, shiny things. This girl was certainly a pretty, shiny thing, sparkling in the freshness and newness of her soul. He felt old suddenly, because he didn’t want to be the one to dim that spark. But he was unable to keep away. The dragon coveted. Her companions dragged her off, evidently knowing a bad thing when they saw one. That warrior with her wasn’t human. Brand would bet his entire hoard on it, which meant the quartet probably belonged to the native supernatural population that lived here: the Kivati. Norgard had warned him to steer clear for the moment. This was a chance at a new life. Brand wouldn’t let the chains of his past catch him. The west was wild. It took a fearless heart to thrive on this lawless frontier. Perhaps here he’d find a woman who didn’t mind the risk involved in being with one of his kind. He watched the retreating back of the Kivati woman and felt a lick of hope that he hadn’t let himself feel in a good, long while. Another supernatural race. She was used to magic, to scales and claws. His true form wouldn’t be a surprise. She might not run screaming into the night. Ye gods, but that was a dangerous thought. He shook himself and ran his hand over the lump in his vest pocket, where the Deadglass lay quiet and still as ten tons of lead. It wouldn’t be much use out here, not where so few people had passed through the Gate to the Otherworld. The ghosts would lie quiet in a place like this. Easy graves, not like the teeming, angry wraiths in the tenements he’d left behind. Not like the bitter souls of the old world where centuries of the dead had worn the paths through the Gate into deep grooves. He would drop the Deadglass into the bottom of the Pacific, but Norgard had insisted he bring it. So here he was. Ready to plant his stake in the new city the Drekar Regent was building. Norgard had rescued him from a black funk, and Brand was grateful. He might still be back in Sweden mired in that despair, or worse. He already felt more hopeful, and for the first time in five years he was excited to start work on a new project. He envisioned a grand chandelier made of glass icicles and lit inside by those new electric lights. A work of contradiction and contrast: ice that didn’t melt, fire that didn’t burn. He could already see the glass inflating at the end of his blowpipe, feel it mold to his design. It would be good to work again. Seattle was his chance at a new life. No more hiding. Available for [Amazon kindle] and [Nook]. Publishers Weekly chose Hearts of Darkness as one of their best summer reads of 2012! I’m in good company as one of their five romance picks along with one of my favorite authors, Nalini Singh (squeee!). Thank you to all the contest entrants! Random.org picked five winners, who have been emailed. If you are a book reviewer, I still have some copies ear marked for you. 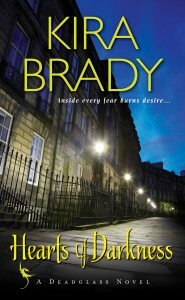 Please email me at kira brady author @ gmail.com (no spaces). It’s been a stressful few months, not at all keeping with what the beginning of the Summer of Awesome should be, so it’s time to embrace the sun (quick! run outside, Seattleittes, and see it now!) and get this big adventure started off right. Please join me in kicking the Deadglass Trilogy off with a contest for 3 autographed ARCs and cover flats of the book Publishers Weekly called, “Dazzling…thrilling…irresistible.” I’ll be celebrating all summer long with book contests and a blog tour, sharing details of my Grand Tour of Europe, and giving away Scottish tea, Seattle coffee, and Swiss chocolates. For our Grand Tour, we are hitting up Edinburgh, Isle of Skye, Brussels, Paris, and Chamonix. We have nothing specific planned except Mr Kira’s summit of Mt. Blanc. Leave a comment on this post for a chance to win a signed ARC of Hearts of Darkness, the first book in the Deadglass Trilogy. Please share: If you were designing your own month long vacation, where would you go? Contest ends Thursday, June 7 @ 11:59 pm PST. Please note: you must include a valid email address with your comment to be eligible. (Sorry, but US residents only for this one.) Three names will be picked by Random.org. PS: By the time I finished typing this up, the sun had returned to its perch behind the clouds. Such is Seattle weather. Hearts of Fire, the reimagining of the great Seattle Fire and the start of the Drekar-Kivati War in the Deadglass World, is finally available for preorder! This novella is ebook only and will be released June 26. I had some fun writing this Romeo and Juliet tale of two wide-eyed dreamers from enemy races. It’s not necessary to read Hearts of Fire before Hearts of Darkness (especially when I wrote Hearts of Darkness and half of Hearts of Shadow before I ever thought about writing a novella! ), but it’s a fun read and provides some background to the gritty modern world of the Deadglass. And best of all, it’s only $0.99! Happy Norwegian Constitution Day! We celebrate May 17th in Ballard with (what is rumored to be) the largest Syttende Mai parade outside of Norway, because we like to pretend we’re still a fiercely independent city of Viking descendants. 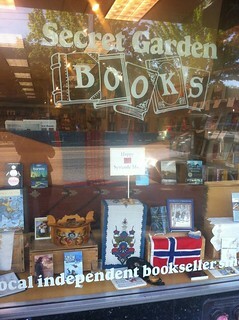 At right is a picture of our local independent bookstore’s Syttende Mai display. Other major festivals are Viking Days in the summer, and Tivoli and Yule Fest at the Nordic Heritage Museum. It doesn’t matter if your Norwegian ancestors hated your neighbor’s Swedish ones; we’re all one big happy Norse family in Ballard. May 17th for Ballardites is like March 17th for Americans–everyone is Irish on St. Patty’s Day! On Syttende Mai, you too can eat pickled herring, aebleskiver, and rye bread and pretend you traveled here by dragon boat. Or you could read the Deadglass Trilogy where the Ballardites are really immortal Viking dragon shifters and their Norse human followers. It’s like a freaky alternate reality where all the jokes are real! Edited to add: Click here for scenes from this year’s parade on MyBallard. I need to get my kiddo one of those traditional dresses for next year. So cute!